How to use the configuration wizard to create Sales Analytics. How changing answers to wizard questions impacts dashboards. How to use a lightweight, iterative approach to creating the app so it meets your business needs. It’s time to jump in and create the app. In the Analytics Apps Basics Trailhead module, you did that using the fast Basic creation option. This time, you do it again with the Custom option, which means you get to try out the built-in configuration wizard. As you work, keep in mind the rules of using the wizard you read in the Analytics Apps Basics module. Your goal: To get Laura a working version of Sales Analytics so she has quick access to KPIs showing her team’s quarterly results. Start by taking a sec to look at what you created in the Analytics Apps Basics module. Log in to the org you set up in Analytics Apps Basics and click the App Launcher ( ). Then click the Analytics Studio tile. The first time you open Analytics Studio, the Welcome screen appears, offering resources to help you get started. You can dismiss it now, and open it again anytime from the Help menu. Click the question mark at upper right to open the menu. Then select Welcome to Analytics. STOP! If you haven’t completed the Analytics Apps Basics module, go there first. In that unit, you sign up for a special Analytics Developer Edition org, which you must have to complete the rest of the Sales Analytics Trailhead module. You also create your first version of Sales Analytics in that module, which you’ll need here. If you’ve previously set up a Developer Edition org for another trail, it won’t work with Sales Analytics. Locate My First Analytics App under the Apps area of the page. Click Run App on the right to see the app’s home page. Do not use the options to upgrade or reset your app if they’re available. Doing so changes Sales Analytics dashboards and the examples in the trail won’t match the app in Developer Edition. Remember one of the rules of using the wizard: “Use it to fine-tune your analytics experience.” Put another way, that means there are many aspects of dashboards you can’t change. For example, scroll through the list of dashboards, find the Executive Overview dashboard, and open it. You can be sure that will catch the CEO’s attention, right? 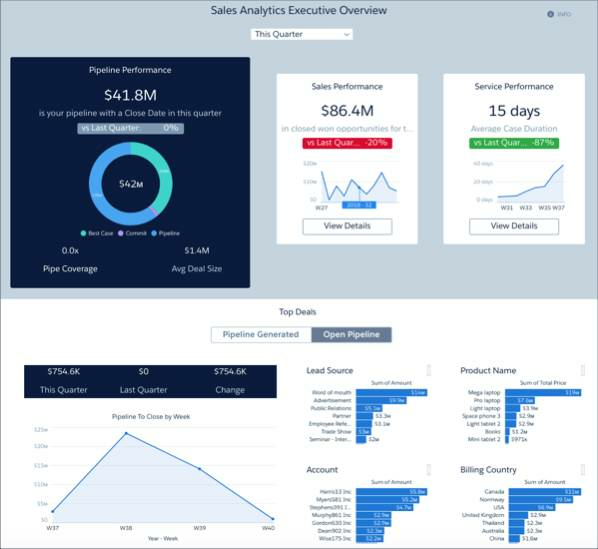 Don't worry if your dashboards look a bit different from the examples here and elsewhere in the Sales Analytics trail. The basic elements of the dashboards should be the same even though the data may differ. The wizard doesn’t let you change the top part of this dashboard. In fact, many Sales Analytics elements can’t be changed by the wizard selections. Remember: We’ve prebuilt Sales Analytics and all the other Analytics apps to make analytics easy, right out of the box, with little effort on your part. That said, some things are under your control through the wizard. Let’s have a look at an example. Now have a look at the wizard. In Analytics Studio, click Create in the upper right and select App. Select Start from Template and click Create. Scroll through the templates, find Sales Analytics and select it. Click Continue. Be sure to select Sales Analytics and not another template, otherwise you may not be able to create an app. On the app preview page, click Continue. Select My First Analytics App, click Continue. Give the compatibility check a few seconds to run. Then click Looks good, next. Now instead of Basic, which you selected the first time you create the app, select Custom. That opens a screen that lets you add objects to your app. We’ll come back to that in a minute; for now click Looks good, next. Have a look at the first two questions, which ask how you want to segment customers. The Sales Performance dashboard uses those answers to determine what goes in some of the filters across the top. Here are the wizard questions (on the left) and the dashboard filters (on the right). The questions in the wizard you see in your Developer Edition, and their order, may differ slightly from the ones shown here. We periodically update wizard functionality and the phrasing of questions and explanations, as well as their order. As long as you follow the instructions here, Sales Analytics should create your app successfully. See how Account Type and Industry in the wizard end up as filters in the dashboard? The other filters across the top can also be changed by the wizard, as can some filters in other dashboards. To see details about how to control dashboards with wizard selections, see the Sales Analytics Dashboard guide listed in the resources section at the end of this unit. Close the wizard by clicking the X in the upper right corner. With that in mind, it’s time to create the app, this time with . In Analytics Apps Basics, you created the app using the Basic option. That created the app using the standard settings. It’s as if you had run through the wizard and accepted all the defaults, only it did that with just a click or two. This time, you use the Custom option to vary the default settings and use the wizard. To keep it simple, we’re only going to change a couple of settings. You’ll get a feel for how the wizard works and how to use it in your own org. And you’ll see that your answers to the wizard questions really do matter! Do not use the options to upgrade or reset your app if they’re available. Using these options changes Sales Analytics dashboards and the examples in this module may no longer match the app in Developer Edition. 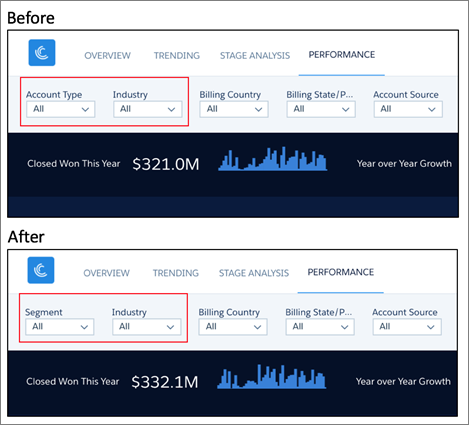 In Analytics Studio, follow the steps to create Sales Analytics again, like you did in the last section. That is, click Create, select App, and click Start from Template. Then select Sales Analytics and click Continue twice. Select Create a brand new app. Click Continue. After the compatibility check runs, click Looks good, next, then Custom and click Looks good, next. This brings you to the page we looked at a moment ago that lets you add objects to your app with Products and Cases preselected. When Analytics runs the compatibility check, it looks for the objects you see on this page. We’ve included Products and Cases in your special Developer Edition org, but not the other objects (which are grayed back here). You can deselect them, but let’s leave them—you know that DTC uses data about products to measure results. And it sounds great to see customer service cases data with your sales data. So leave them as is and click Looks good, next. In your own org, you can add other objects to your app here, but we only want Products and Cases for our example app. You see the first page of the wizard. Go to the first question, about the first field to use to segment customers. It has Account Type—but you’re going to try something a little different: You know that Laura usually likes grouping customers according to the segment. So look for Segment in the answers to the first question and select that. Leave Industry in the second question, like this. Click Looks good, next, and move on to questions about the Opportunities object. Open the list of answers to each question one at a time and scroll through them. You should be able to tell that very few of the choices would work. For example, the first question asks about total amount of the opportunity, and the default selection is Amount. The other possibilities—Expected Amount, Probability, and Quantity—clearly aren’t right. That’s an important wizard rule in action: that only some answers make sense. On that page, go to the question about the field that indicates an opportunity is new business (not the question that asks about segmenting sources for new business.) You see that the default answer is Opportunity Type. But you’re feeling confident and want to try something different, so select Opportunity Source. Click Looks good, next a few more times to move through the rest of the wizard. As you do that, keep your eye out for one question you should know about: “How would you like to control data visibility in Sales Analytics?” Your answer controls data security in your app. Choosing the default lets Laura and other users view the data they own as well as the data owned by the people who work for them. In other words, it uses the standard Salesforce Role Hierarchy for data security. Leave that as is for now, but if you ever need to change data security for a particular app, this is the place to start. You can learn more about Salesforce Role Hierarchy in the document listed in the Resources section at the end of this unit. When you get to the Name your app dialog, type in Analytics for Sales Managers and click Create. This takes a few minutes, so grab that cup of coffee, watch cat videos, or whatever you like to do to pass time. You could also have a look at more details about the wizard in Salesforce Help. Soon, you’ll receive an email stating that the dataflow ran successfully, and you can move on to the next section. You just created your Sales Analytics app. Congrats! Now it's time to run the Trailhead Data Manager, which we introduced in the Analytics Apps Basics module. This step brings the right data into your app so you see meaningful data in dashboards. In the “real world,” you never have to do this when you create Sales Analytics with your own license. So we invite you to blast through without thinking about it too much. Be sure you can see the dashboards for your app before running the Trailhead Data Manager. Also, you only need to run the data manager in Trailhead. You won’t have to use it to set up Sales Analytics in your own org. From Analytics Studio, go to the app picker at upper right and select Trailhead Data Manager. You may have to scroll down to find it. Select the Trailhead Data Manager link below Items. 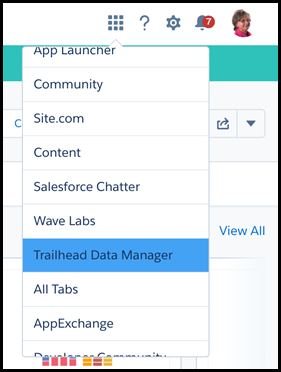 Then select Trailhead Data Manager on the next page. On the Trailhead Data Manager home page, click Refresh DTC Data. Give it a few minutes to run. If you see a message that your data is up to date, skip to the next step. Once your data is up-to-date, click the Download Trailhead Dataflow circle. From the dropdown menu, select Analytics_for_Sales_Managers. If you don’t see your app in the menu, you need to wait until the app creation process has finished. 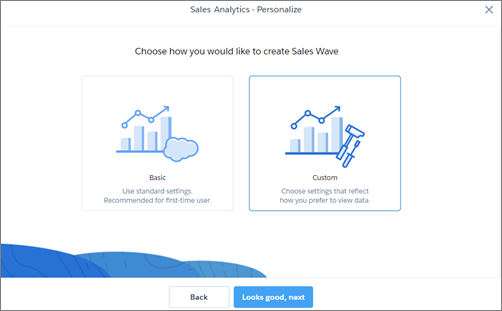 Click the Download Dataflow for Analytics_for_Sales_Managers_for_Trailhead button. The file is saved in your Downloads directory. It should be called Analytics_for_Sales_Managers_for_Trailhead.json. Go back to Analytics Studio by selecting it from the app picker at left. Click the gear icon in the upper right, and select Data Manager. (This is the Analytics Data Manager, not to be confused with the Trailhead Data Manager.) Below the page title (Monitor), select DATAFLOWS. Scroll to Analytics for Sales Managers. Open the menu on the far right opposite the app name, select Upload. Click Select a file, navigate to the file you just saved in Downloads (Analytics for Sales Managers_for Trailhead.json), and select it. Click Open, click the Upload button, and then click Done. Finally, open the menu on the far right next to the app name again, and select Run Now. Below the page title (Monitor), selectJOBS. You can see the status of the dataflow to the right. Click the refresh button a few times until the status changes from Running to Successful. If you see a yellow Warning instead of Successful, you can ignore it. This is the result of a known issue, and your app will work fine. Now that you’ve refreshed the data, go back to Analytics by clicking the gear icon at upper right and selecting Analytics Studio. 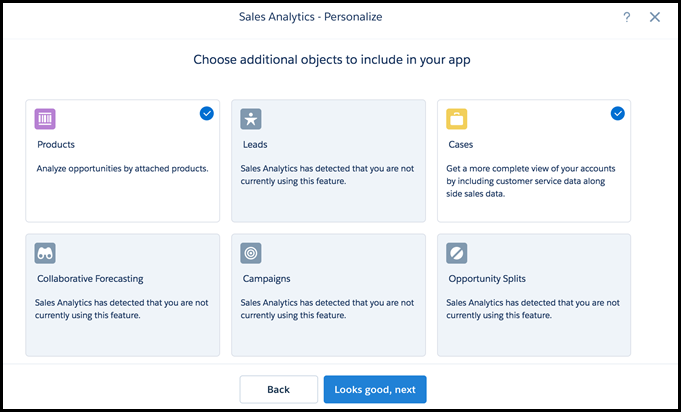 Click Analytics for Sales Managers to see all the app’s assets, including dashboard, lenses, and datasets. In the search bar at the top, enter Sales Performance. Then open the Sales Performance dashboard to see what you did. The first version had Account Type and Industry filters at the far left. The second has Segment and Industry filters instead. Just to see how the dashboard works, open the Segment filter to look at a list of DTC’s various market segments. Choose SMB and click Apply. Now you can look at just accounts in the small-medium business segment. To go back to the dashboard in its original state, click the reset button above the dashboard. Now go to the My First Analytics app and open the Sales Performance dashboard. Open the Account Type filter, which lets you select only from between Customer and Partner. It’s a subtle, but important change. Laura can now filter all the performance dashboards exactly the way she wants—looking at all the data according to segments. Previously, filters gave Laura a choice between looking at customers or partners, that is customer types, and she wanted to see a breakdown of customers. The new Segment filter shows sources of business broken down according to DTC’s market segments—exactly what she wants. Nice! Now, let’s look for the results of the other change you made: Selecting Opportunity Source instead of Opportunity Type. Look at the filters further to the right. One of them is now called Opportunity Source.Go back to My First Analytics App and open the Sales Performance dashboard. The filter in the same location is called Opportunity Type. You can see the same change to all the other performance dashboards (by geography, by source, and so on), and other dashboards, too. One small change made a difference, right? We deliberately made this simple, to help you get Laura what she wants fast. Likely, when you use the wizard to create your own app, it will take a little more thought and effort. But you get the idea: the wizard guides you through the process and tries to eliminate as much complexity as possible. Since you’re happy with this second version, you can delete My First Analytics App and any other apps you’ve created along the way. Select the Analytics Studio tab, find My First Analytics App, and click Run App. Select the icon at upper right, and click Delete. Confirm that you want to delete the app. Repeat this for all other apps you might have created, except Analytics for Sales Managers. You want to have a clean org with only one app before you move to the next unit. Great work—you’ve created a pretty useful app. Your filters are working like a charm and you have products showing in other dashboards. Of course those are just some of the dashboards—you can go through the others on your own to get ideas about what you’d change if you were to keep going with this process. But for now, you’re happy, and Laura and the CEO should be ecstatic! It’s time to switch from coffee to champagne! You can see the forecast, but you can’t see how your team’s doing against its quota! Oh no! You forgot that you store and track data about the sales team’s quotas in a tool outside Salesforce. For the moment, your bubble bursts, but never fear: You’ll learn how to import the data into Sales Analytics in the next unit. Thinking back to not so long ago, you remember how long it used to take to get all this data, and the form it used to take—a boring-looking set of reports. 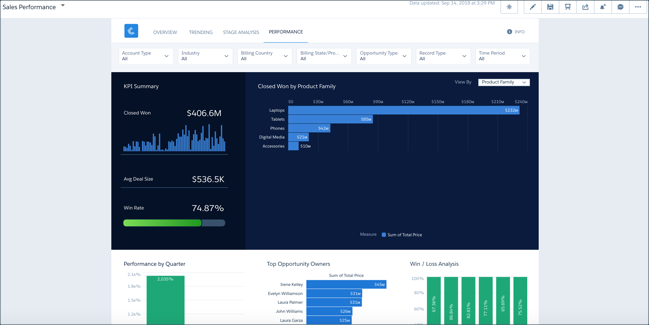 But now that you have Sales Analytics, Laura and the CEO can quickly get all DTC’s KPIs in one place and look at everything in snappy, interactive dashboards. And you got there with just a few quick runs through the wizard. Of course, you’ve only done that with a few dashboards. But you can see just how fast and how intuitive the process can be, as long as you take a step-by-step approach and remember a few key rules when using the configuration wizard. Create and Share the Sales Analytics App. 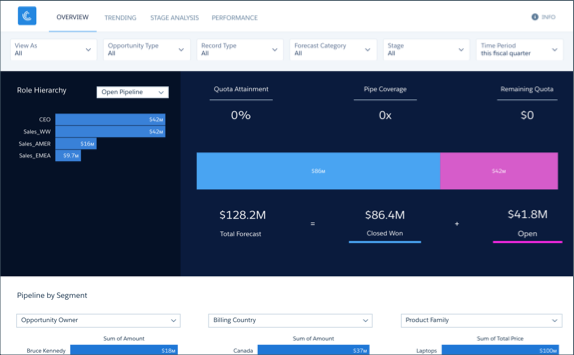 Personalize Sales Analytics with the Configuration Wizard. Sales Analytics Prebuilt Dashboards, Lenses, and Datasets.